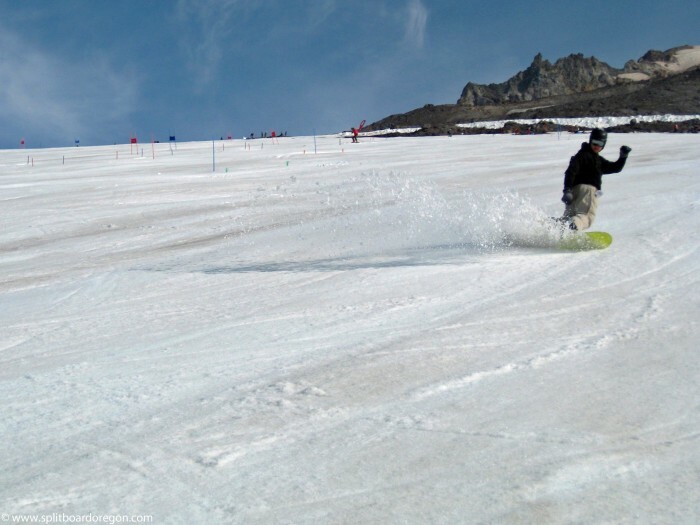 I was looking forward to August turns as I headed up to Mt Hood’s Palmer Glacier, where I met Todd to make some lift-served riding. I had been up the week before practicing glacier travel and crevasse rescue on the White River Glacier and wished I’d had my board for the ride down. The weather was sunny and nice and the snow on the Palmer looked good as we loaded the Mile lift. We spun several laps on the snowfield and conditions were good. As usual, there were a few race courses set up with Olympic caliber skiers practicing their skills, and lots of campers down below at the ski and snowboard camps. There weren’t too many people just out enjoying the riding on the snowfield though.